"Did you know that in this land of the free and home of the brave there is a great baby market? And the securities which change hands...are not mere engraved slips of paper promising certain financial dividends, but live, kicking, flesh-and-blood babies." --From the Article "The Baby Market,"
The Saturday Evening Post, February 1, 1930. This book made me feel A L L the feels. I can't believe this book is based on fact. I had never ever heard of Georgia Tann, the woman who pioneered child trafficking in America during the Great Depression, and all that she got away with...makes me so angry and breaks my heart all at once. Although the children in this book didn't actually exist, their stories are based on real stories from real survivors of Georgia Tann's children's home. The book follows present day Avery Stafford and twelve-year-old Rill Foss. Rill and her four younger siblings: Camellia, Lark, Fern, and Gabion, grow up on the river in a shanty boat. We enter her story in August 1939 when her mother and father leave them to go to the hospital, telling them to not leave the boat and stay hidden. The next day, thinking it's their parents, they are stolen away being told that they are going to visit their parents later. But Rill knows better. Rill and her siblings end up in the Tennessee Children's Home Society, run by Georgia Tann, where they are beaten, neglected and separated. Flash-forward to the present day and we meet Avery Stafford. Daughter of a senator, engaged to her childhood best friend, and a successful lawyer, Avery believes she has it all. Until the day she visits a nursing home and meets May Crandall, who believes her to be someone else. Avery soon gets swept up in old family history, unraveling her grandmother Judy's past and begins to question on whether or not what she's believed she's always wanted is actually what she wants. I loved this book and everything about it. It was one that I was sad to finish. The characters came to life on the page and their story made it impossible for me to put down. While reading, I had to remind myself to slow down, but when I wasn't reading, all I wanted to be doing was reading...so reading slowly didn't happen. It doesn't surprise me at all that this book has been a number one seller for over a year. Lisa Wingate really out did herself on this one. It's not always easy to jump from past to present day, but she did it seamlessly. 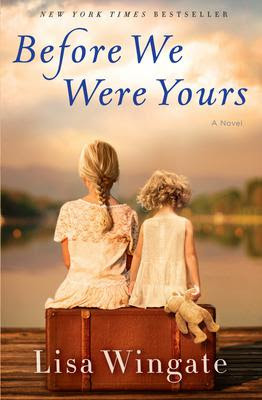 For more information on Before We Were Yours by Lisa Wingate, visit us in store or visit our website here.